Craps Facts Trivia is entertaining info about one of the most exciting table games. This report covers history, winners, superstitions and Craps Facts Trivia concludes with an amusing and informative article by craps expert Frank Scoblete. The quick play and excitement of winning money at a fast pace makes craps popular in casinos around the world and online. Bettors and curious onlookers alike hold their breath as the shooter fires the dice down the table. If luck and skill are the side of the shooter, the crowd will erupt in delight as the casino staff scrambles to stack chips and pay off bets. Gleeful gamblers shout out instructions, Let it Ride! Press the Four! Origin of craps in a game called hazard that dates back to the Crusades. French and British settlers brought craps to America. The modern name is derived from the French word Crapaud that means toad. Some think that this refers to the way players looked like toads when squatting down to shoot dice on the street. John H. Winn is responsible for the modern layout and betting styles seen in casinos today. Popularity soared during the mid-20th century as soldiers in World War II played during their down time. The 75 casinos in the greater Las Vegas area have approximately 297 craps tables. The table minimums range from $1 to $5000 per roll. With a house edge of only 1.4% for specific wagers, craps offers some of the best odds among table games. The longest verified roll in a casino is 154 rolls that happened on May 23, 2009. In only her second time playing craps Patricia Demauro rolled dice for 4 hours and 18 minutes at the Borgata Hotel Casino in Atlantic City. The Captain turned in another monster roll in 2005 with 147 numbers before he sevened out. This monster roll took two hours and 18 minutes. In the mid-1990’s Archie Karas turned $17 million into $40 million by betting on craps over a span of several months. He would often bet $100,000 per roll. In 1980 William Lee Bergstrom bet $777,000 on the Don’t Pass line at Binions Horseshoe Casino. He won. There is no regulation size to a craps table. The tables in most casinos are 12 or 14 feet long. One of the dice manufacturers for Las Vegas casinos manufactures about 25,000 pair of dice every month. Craps die are red in color and not opaque as the ones used in monopoly games. Each table requires four casino employees – the box person who monitors the rolls and supervises monetary transactions; two dealers that place and pay out bets; the stickman who pushes the dice to players and handles the proposition bets in the middle of the table. The player rolling the dice is only allowed to touch them with one hand. If they reach for the dice with two hands, they will be warned by the stickman. The dealers cannot handle money directly from players. Cash must be laid on the table. In most casinos, the dice must reach the far end of the table to be considered a valid roll. It is considered unlucky to say 7 when at the table unless it is during the come out roll. However, a penny placed under the table is considered good luck. Craps is another country, a kingdom with its own legends, myths, rites, rituals, superstitions and its own language.The citizens of Crapsylvania are a cantankerous, narrow-minded bunch and you had better learn their customs and concerns because they certainly won't tolerate any deviation from their patterns. Therefore the need for my craps to English dictionary. The first word you should know is a compound word=come-out that is the start of a craps game, as in "shooter on the come-out roll!" Next are the words pass and don't pass. These words have nothing to do with making moves on the ladies, but merely two bets that can be made on the table. 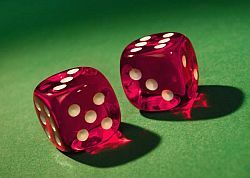 Here are other bets that can be made at craps: Craps, which are the numbers 2, 3, and 12 in tandem or alone; yo=the number 11; Big Red=the number 7. Yes, the seven is dreaded if you are a right bettor=betting with the shooter and against the appearance of the seven, but it is not dreaded by a wrong bettor=betting against the shooter and for the seven. Boxcars are the two six-spot dice, while a boxman is the person who sits in the middle of the table and oversees that the game is handled properly by the dealers who run the game. Little Joe is a hard four, while Ada from Decatur is a hard eight and snake eyes are the two one-spot dice. A sleeper is a bet that has been left behind on the table while its owner has left on the table in his rush to leave the game and, perhaps, the casino. Single, double, and triple odds are not some weird couplings but how much you can proportionally increase your pass, don't pass, come and don't come bets when they are on the number. So, too, with 5X, 10X, 20X and 100X odds, which are not shirt sizes, but bet sizes. A proposition at craps one of the bets in the middle of the layout that has a high house edge. Vig or vigorish is another term for the house edge. The field is an area on the layout where you can wager that one of the following numbers will hit on the next roll: 2, 3, 4, 9, 10, 11, or 12. To make your point is to hit the number you must hit before the seven shows in order to be a winner! A hop bet is not made on one foot but is a bet that a specific combo that you pick will appear on the next roll. A hot shooter is someone who's making money for the table by rolling numbers and points. The horn bet is a one roll bet that the 2, 3, 11, or 12 will be rolled. A place bet is one that is made directly on the box numbers at the top of the layout. A crazy crapper is not an insane person but a person who makes insanely poor bets with high house edges at craps, such as the hardways, the hops, the any craps and so on. This amusing and educational article concludes Craps Facts Trivia report. Knowing some craps facts trivia won’t help a gambler win, but you are sure to be entertained and smile! Sic Bo is played with three dice and a cage shaker, played on a table with pictures displaying the 50 possible bets and their payouts. Sic Bo=1 of 10 Dice Games Defined.